Presence and Engagement is the Church of England's national programme equipping Christians for mission and ministry in our multi faith society. It began as a national listening exercise leading to a report which was discussed at the Church of England's General Synod in 2006. A key resource is a growing network of Diocesan Inter Faith Relations Advisers. The website aims to bring together resources for clergy, congregations, chaplaincies and schools who want to follow Jesus in loving their neighbours of different faiths. Presence and Engagement has been complemented by Near Neighbours , a government-funded initiative managed by the Church Urban Fund . Presence and Engagement - a research-based report presented to the 2005 General Synod. It concerns the life and mission of local parishes in multi faith areas. It particularly focuses upon developing strategies for supporting clergy and encouraging theological reflection. Sharing the Gospel of Salvation - a selection of case studies of the most vital and innovative inter faith work being done in the Church of England today. Generous Love for All - five year Presence and Engagement plan prepared for a debate at Synod on July 11th 2011. Presence and Engagement: Learning Pathways - a manifesto for ideal patterns of interfaith training within the Church of England. Local Christian-Muslim Friendship - leaflet illustrating how friendships can develop within local communities through Mosque-Church twinning. Theos Report on Faith and Identity - 'Religion and Identity: Divided loyalties?' by Sean Oliver-Dee. St Ethelburgas - Spectrum: detailed guide to building inter-religious relationships. The Living with other faiths resource pack provides materials which can be used flexibly - for study evenings and days, and for longer courses, helping churches in different kinds of contexts to minister faithfully, sensitively and effectively in our multi-religious society. identify Biblical principles for engaging with people and congregations of other faiths. develop understanding of their beliefs and sensitivity to their practices. work out the best ways for your church to build relationships with other faiths. 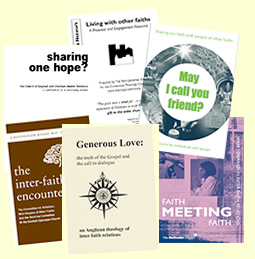 The Methodist Church Interfaith resources web page lists a number of Methodist publications as well as some published by other churches/organisations, including May I Call You Friend, Faith Meeting Faith and the booklet Dialogue and Evangelism among people of other faiths (some are available to download in PDF format). A communion of churches that have signed an agreement to "share a common life in mission and service". These churches are either Anglican or Lutheran. Background to the letter A Common Word, offering commentary on the issues that lie behind it and suggestions for further reading and activity.